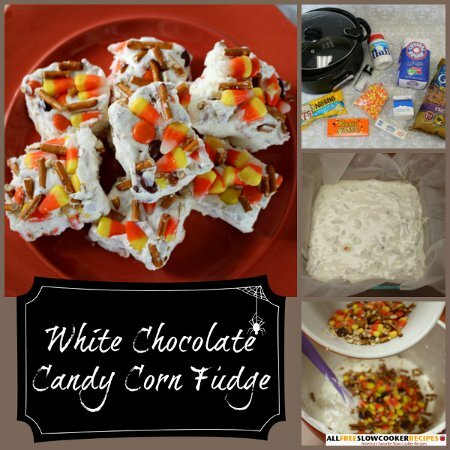 This recipe for White Chocolate Candy Corn fudge is like the epitome of Halloween: candy, candy and more delicious candy! If you've got a hankering for something sweet and festive as Halloween season rolls around, then whip up a batch of this white chocolate fudge and enjoy each and every scarily delicious square. Using the slow cooker to make this homemade fudge recipe keeps things simple and worry-free. The fudge can be made without even turning on the oven or stressing about over-heating butter in the microwave. 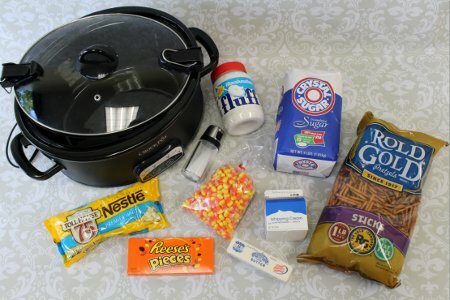 Cooking in the slow cooker ensures a gradual and even heating of the ingredients, so you can be off hanging party decorations or finishing sewing the final touches on Halloween costumes as the marshmallow fudge recipe begins to cook. 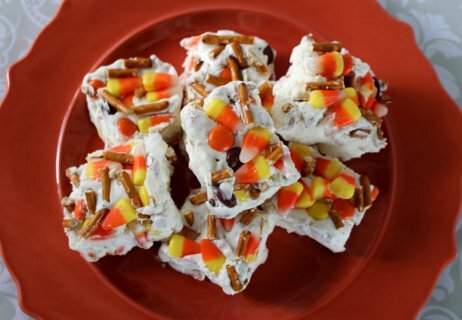 If you have a toothache from eating too many other sweets during Halloween, then you will appreciate the saltiness that the pretzels add to this recipe. Feel free to throw in some chopped peanuts or any other leftover Halloween candy you have to make the recipe even more unique. This easy fudge recipe can be adapted to fit any season or holiday, so make sure to keep it on hand throughout the year! 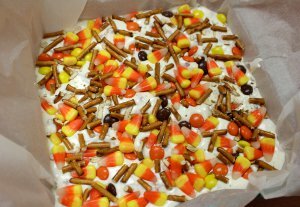 Note: This recipe was adapted from Jenn's "Slow Cooker White Chocolate Candy Corn Fudge" recipe from GetCrocked.com. 1. 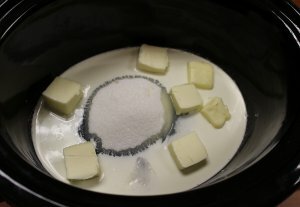 Place sugar, heavy cream, butter and salt in the slow cooker. 2. Cover, and cook on LOW for 1 1/2 hours (or until ingredients are melted and heated through). Stir occasionally. 3. In a medium bowl, crush up pretzel sticks with the back of a cup. Add candy corn and Reese's pieces and set aside. 4. In a separate bowl, combine white chocolate chips and marshmallow fluff. 5. Once the slow cooker ingredients are heated, pour the hot mixture over the chocolate chips and marshmallow fluff to melt them together. Stir until smooth. 6. 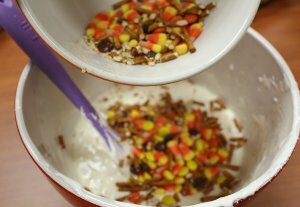 Add all but 1/2 cup of the candy corn mixture to the white chocolate and marshmallow bowl. Fold in the ingredients until well-incorporated. 7. 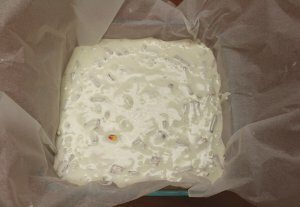 Line an 8 x 8 baking dish with parchment paper. 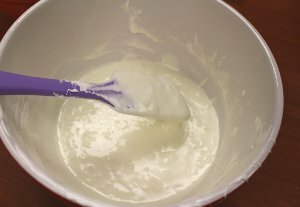 Pour the mixture into the dish and spread it out into an even layer. 8. 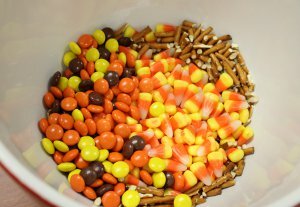 Sprinkle the remaining candy corn mixture over the top of the dish. Lightly press down on the candy to make sure it sticks in the fudge. 9. Refrigerate the fudge for 3 hours, and then freeze for 1 hour before slicing. 10. Cut into squares, and enjoy!